Bitchy Boy play a fat, funky mix of catchy songs underpinned by bitchin’ guitar-based grooves.The strong songs and musicianship of Bitchy Boy allow them to play a range of venues such as The Corner Hotel, The Espy, The Evelyn Hotel & Manchester Lane, as well as more intimate acoustic settings.Solo acoustic gigs played by Mark Hughes include The Corner, The Espy and Revolver Upstairs. 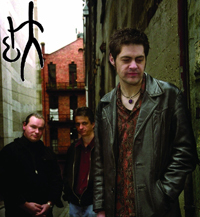 Bitchy Boy successfully launched their debut EP, 'Time Thief' in Sep 2003 at Manchester Lane with an 8-piece band, playing to a full house with queues outside. In Jan 2004, Bitchy Boy staged the ‘Planet Bitchy’ show at The Corner Hotel, and four tracks from the Time Thief EP were played repeatedly on new extreme sports show, ‘Cactus Garden’ on Channel 10. Club Acoustica represents a fantastic opportunity for all the talented songwriters & performers we have in Australia to not only perform, but to further their contacts with other musicians at the same time.